The city of Jurupa Valley will have extra patrol this Fourth of July to combat the use of illegal fireworks. All Fireworks, including sparklers, are ILLEGAL in the city of Jurupa Valley; meaning you may not sell, purchase, transport, store or use fireworks in the city of Jurupa Valley. Fireworks are illegal because they cause serious injuries and very often, cause fires. The city of Jurupa Valley has very diverse terrain. The vegetation is very dry, and fireworks can easily start a brush fire. Individuals who cause a wildfire by using illegal fireworks will be held responsible for all suppression costs and could be criminally prosecuted. These costs can run into the millions of dollars. The Jurupa Valley Police Department, CAL FIRE/Riverside County Fire Department and Jurupa Valley Code Enforcement aggressively enforce the city fireworks ordinance, as well as other laws pertaining to the sale, transport, manufacturing, storage and use of illegal fireworks. 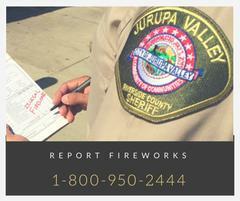 In the city of Jurupa Valley protecting the safety of the public is a top priority and we enforce a "zero tolerance" policy with regard to citizens in possession of illegal fireworks. Those caught with illegal fireworks will be subject to fines, citations, arrest and confiscation of all illegal fireworks. We urge you to leave the fireworks to the professionals.